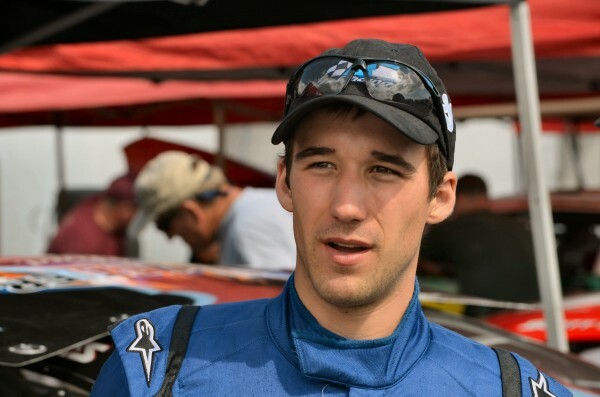 Fort Kent driver Austin Theriault finished in 15th in Sunday's NASCAR Nationwide race in Newton, Iowa. NEWTON, Iowa — Sam Hornish Jr.’s NASCAR Nationwide Series countdown at Iowa Speedway nearly followed a perfect path. The part-time Joe Gibbs Racing driver — who finished second, third or fourth in his previous three races at the 7/8-mile track — dominated Sunday, leading 167 laps en route to an all-smiles triumph in the Get to Know Newton 250 presented by Sherwin-Williams. “I just couldn’t be happier right now,” the driver of the No. 54 car said. Hornish pulled away from his only stern competition, Coors Light Pole sitter Ryan Blaney, on a lap 229 restart and celebrated his third career series victory. Fort Kent driver Austin Theriault finished 15th in his first Nationwide race. Theriault, 20, qualified 17th for the race and had climbed into ninth place before the last restart. Theriault drove the No. 5 Chevy Camaro for the JR Motorsports team. Blaney excelled in long runs, led 80 laps, but settled for second. Regan Smith, who hasn’t finished outside the top 10 all season, took third, with points leader Chase Elliott and Elliott Sadler finishing fourth and fifth, respectively. But none of these three drivers were able to interrupt Hornish’s or Blaney’s hold on the lead, which spanned all but three laps. Elliott nurses a narrow two-point lead over both Smith and Sadler in the point standings and survived two slow pit stops to notch his fifth top-five finish of the season. “Hopefully we can have those fixed before next week,” the recent high school graduate said. Hornish noted that past near-misses at Newton helped steer him to Victory Lane this time in a race marked by five cautions. Hornish, 34, is slated to run five more races for Gibbs this season, with enhanced opportunities possibly lurking on the horizon. And he’s OK with that. The uncertainty Hornish faced in the offseason, coupled with the abbreviated schedule, allows him to “pay back” his wife, Crystal, who in February gave birth to the couple’s third child, son Sam III. And, like he said, he couldn’t be happier — as a part-time driver, and closer to full-time dad.